RepuGen, ("RepuGen," "we" or "us") provides small businesses and organizations with a variety of products and services and related offerings, features and functionalities (individually, a "Product" and collectively, the "Products"). This website (including any related sub-site, service, feature or functionality) (the "Site") and the Products are provided subject to these Website and Product Terms and Conditions of Use, as they may be amended by us, and any guidelines, rules or operating policies that we may post on this website, including, without limitation, our policies, which are specifically incorporated herein by reference (collectively, the "Agreement"). We may amend this Agreement from time to time due to changes to the Site or the Products, to account for developments under the law, or for any other commercially reasonable reason. Future performance by us of our obligations under this Agreement is sufficient consideration for any such amendment. Any amendment will only become effective upon notification to you (by email or by posting on our Site) and, if you do not want to agree to any such amendment, you should stop using the Site and the Products and contact us to cancel your account. By checking the box next to the "Do you agree?" button on the sign-up page, by logging in to your RepuGen account, by accessing the Site or by accessing any of the Products (including by means of any API interface), you accept this Agreement on behalf of yourself and any business or organization you represent (collectively, "you"). Any terms and conditions that may be contained in any acknowledgement, invoice, purchase order or other form you provide are specifically null and void. The Site and the Products are available only to persons or organizations that can form legally binding contracts under applicable law. Without limiting the foregoing, the Site and the Products are not available to individuals under the age of 18. If you do not qualify, you are not permitted to use the Site or the Products. If you are using the Site or the Products on behalf of an organization, you represent and warrant that you have the ability to bind such organization by your use of the Site and the Products. We may, in our discretion, permit you to authorize additional users to use your RepuGen account. For purposes of this Agreement, you are the "Account Owner" and any other users you authorize will be deemed "Authorized Users." You will be responsible for each Authorized User’s use of your RepuGen account and each Authorized User’s compliance with this Agreement. RepuGen utilizes the services of various review sites through an API connection. The security of this API connection is handled by the respective sites and RepuGen does not have control over what review sites can and will provide through these API's. For this reason, changes in our service offerings may occur due to changes in policies or access privileges enacted by these review sites. These include but are not limited to: review sites disabling reputation management platforms from accessing their API, changes in the type and frequency of the data RepuGen can receive, penalties against companies soliciting/gating reviews, etc. RepuGen keeps up with the latest policies and will always do what they can to comply with all review site policies as these review sites announce and explain them to the public. RepuGen will do what it can to protect its clients from review site penalties, by complying with these policies as they're described by the respective sites, but we acknowledge that these sites have the right to adjust their services and policies however they see fit, even if it affects our clients in the process. This Privacy Statement covers the information practices of Web sites that link to this Privacy Statement, including: https://www.RepuGen.com & https://www.gmrwebteam.com (collectively referred to as “RepuGen.com’s Web sites” or “the Company’s Web sites”). RepuGen.com’s Web sites may contain links to other Web sites. The information practices or the content of such other Web sites is governed by the privacy statements of such other Web sites. The Company encourages you to review the privacy statements of other Web sites to understand their information practices. 3. Copyright and Trademark Information. The Site and the information it contains, are the property of RepuGen and, in some cases, its affiliates and licensors, and are protected by United States and international intellectual property laws. "RepuGen," the RepuGen logo, are registered trademarks or trademarks of RepuGen in the United States and other countries. This is not intended as a complete list of our trademarks and other RepuGen product or service names or logos appearing in the Site may be trademarks of RepuGen or its affiliates. When expressing an interest in obtaining additional information about the Services or registering to use the Services, RepuGen.com requires you to provide the Company with personal contact information, such as name, company name, address, phone number, and email address (“Required Contact Information”). When purchasing the Services, RepuGen.com may require you to provide the Company with financial qualification and billing information, such as billing name and address, credit card number, and the number of employees within the organization that will be using the Services (“Billing Information”). RepuGen.com may also ask you to provide additional information, such as company annual revenues, number of employees, or industry (“Optional Information”). Required Contact Information, Billing Information, and Optional Information about Customers are referred to collectively as “Data About RepuGen.com Customers”, or in the case of Attendees, “Data About RepuGen.com Attendees”. As you navigate the Company’s Web sites, RepuGen.com may also collect information through the use of commonly-used information-gathering tools, such as cookies and Web beacons (“Web Site Navigational Information”). Web Site Navigational Information includes standard information from your Web browser (such as browser type and browser language), your Internet Protocol (“IP”) address, and the actions you take on the Company’s Web sites (such as the Web pages viewed and the links clicked). The Company uses Data About RepuGen.com Customers to perform the services requested. For example, if you fill out a “Contact Me” Web form, the Company will use the information provided to contact you about your interest in the Services. The Company may also use Data About RepuGen.com Customers and Customer Satisfaction Data of RepuGen.com Customers for marketing purposes. For example, the Company may use information you provide to contact you to further discuss your interest in the Services and to send you information regarding the Company, its affiliates, and its partners, such as information about promotions or events. RepuGen.com may use your customers’ satisfaction data to aggregate with other data for industry level or other analysis. In no event will the company share your company’s specific data. RepuGen.com uses credit card information solely to check the financial qualifications and collect payment from prospective Customers and Attendees. RepuGen.com uses commonly-used information-gathering tools, such as cookies and Web beacons, to collect information as you navigate the Company’s Web sites (“Web Site Navigational Information”). This section describes the types of Web Site Navigational Information used on the Company’s Web sites and how this information may be used. Required cookies Required cookies enable you to navigate the Company’s Web sites and use its features, such as accessing secure areas of the Web sites and using RepuGen.com Services. From time-to-time, RepuGen.com engages third parties to track and analyze usage and volume statistical information from individuals who visit the Company’s Web sites. RepuGen.com may also utilize Flash cookies for these purposes. Functionality cookies Functionality cookies allow the Company’s Web sites to remember information you have entered or choices you make (such as your username, language, or your region) and provide enhanced, more personal features. These cookies also enable you to optimize your use of RepuGen.com’s Services after logging in. These cookies can also be used to remember changes you have made to text size, fonts and other parts of web pages that you can customize. RepuGen.com uses local shared objects, also known as Flash cookies, to store your preferences or display content based upon what you view on our Web sites to personalize your visit. RepuGen.com uses Web beacons alone or in conjunction with cookies to compile information about Customers and Visitors’ usage of the Company’s Web sites and interaction with emails from the Company. Web beacons are clear electronic images that can recognize certain types of information on your computer, such as cookies, when you viewed a particular Web site tied to the Web beacon, and a description of a Web site tied to the Web beacon. For example, RepuGen.com may place Web beacons in marketing emails that notify the Company when you click on a link in the email that directs you to one of the Company’s Web sites. RepuGen.com uses Web beacons to operate and improve the Company’s Web sites and email communications. When you visit RepuGen.com’s Web sites, the Company collects your Internet Protocol (“IP”) addresses to track and aggregate non-personal information. For example, RepuGen.com uses IP addresses to monitor the regions from which Customers and Visitors navigate the Company’s Web sites. RepuGen.com also collects IP addresses from Customers whey they log into the Services as part of the Company’s “Identity Confirmation” and “IP Range Restrictions” security features. Currently, various browsers – including Internet Explorer, Firefox, and Safari – offer a “do not track” or “DNT” option that relies on a technology known as a DNT header, which sends a signal to Web sites' visited by the user about the user's browser DNT preference setting. RepuGen.com does not currently commit to responding to browsers' DNT signals with respect to the Company's Web sites, in part, because no common industry standard for DNT has been adopted by industry groups, technology companies or regulators, including no consistent standard of interpreting user intent. RepuGen.com takes privacy and meaningful choice seriously and will make efforts to continue to monitor developments around DNT browser technology and the implementation of a standard. RepuGen.com may provide bulletin boards, blogs, or chat rooms on the Company’s Web sites. Any personal information you choose to submit in such a forum may be read, collected, or used by others who visit these forums, and may be used to send you unsolicited messages. RepuGen.com is not responsible for the personal information you choose to submit in these forums. Customers and Visitors may elect to use the Company’s referral program to inform friends about the Company’s Web sites. When using the referral program, the Company requests the friend’s name and email address. RepuGen.com will automatically send the friend a one-time email inviting him or her to visit the Company’s Web sites. RepuGen.com does not store this information. RepuGen.com posts a list of Customers and testimonials on the Company’s Web sites that contain information such as Customer names and titles. RepuGen.com obtains the consent of each Customer prior to posting any information on such a list or posting testimonials. 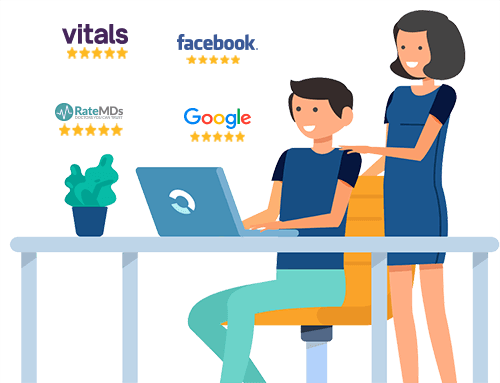 RepuGen.com may share Data About RepuGen.com Customers and Data About RepuGen.com Customers’ Satisfaction Data with the Company's contracted service providers so that these service providers can provide services on our behalf. Without limiting the foregoing, RepuGen.com may also share Data About RepuGen.com Customers and Data About Satisfaction for individual customers with the Company's service providers to ensure the quality of information provided, and with third-party social networking and media Web sites, such as Facebook, for marketing and advertising on those Web sites. Unless described in this Privacy Statement, RepuGen.com does not share, sell, rent, or trade any information with third parties for their promotional purposes. The Company may share Data About RepuGen.com Customers with other companies in order to work with them, including affiliates of the RepuGen.com corporate group. For example, the Company may need to share Data About RepuGen.com Customers for customer relationship management purposes. From time to time, RepuGen.com may partner with other companies to jointly offer products or services. If you purchase or specifically express interest in a jointly-offered product or service from RepuGen.com, the Company may share Data About RepuGen.com Customers collected in connection with your purchase or expression of interest with our joint promotion partner(s). RepuGen.com does not control our business partners’ use of the Data About RepuGen.com Customers we collect, and their use of the information will be in accordance with their own privacy policies. If you do not wish for your information to be shared in this manner, you may opt not to purchase or specifically express interest in a jointly offered product or service. RepuGen.com does not share Data About RepuGen.com Attendees with business partners unless: (1) you specifically opt in to such sharing via an event registration form; or (2) you attend a Company event and allow RepuGen.com or any of its designees to scan your attendee badge. If you do not wish for your information to be shared in this manner, you may choose not to opt in via event registration forms and elect not to have your badge scanned at Company events. If you choose to share your information with business partners in the manners described above, your information will be subject to the business partners’ respective privacy statements. This Privacy Statement sets forth the information RepuGen.com collects on the Company’s Web sites and the information we share with third parties. RepuGen.com does not authorize the collection of personal information by third parties through advertising technologies deployed on the Company's Web sites, nor do we share personal information with any third parties collected from the Company's Web sites, except as provided in this Privacy Statement. Section 4 of this Privacy Statement, Web Site Navigational Information, specifically addresses the information we collect through cookies and web beacons, and how you can control cookies through your Web browsers. RepuGen.com uses a third-party service provider to manage credit card processing. This service provider is not permitted to store, retain, or use Billing Information except for the sole purpose of credit card processing on the Company’s behalf. RepuGen.com reserves the right to use or disclose information provided if required by law or if the Company reasonably believes that use or disclosure is necessary to protect the Company’s rights and/or to comply with a judicial proceeding, court order, or legal process. RepuGen.com reserves the right to contact Visitors and Customers who provide contact information. You may manage your receipt of marketing and non-transactional communications by clicking on the “unsubscribe” link located on the bottom of the Company’s marketing emails. Customers may update or change their registration information by editing their user or organization record. To update a user profile, please login to http://www.RepuGen.com with your RepuGen.com username and password and click “Setup.” To update Billing Information or have your registration information deleted, please email support@RepuGen.com or call +1 (949) 396-2120. To discontinue your account and to have information you maintained in the Services returned to you, please email support@RepuGen.com or call +1 (949) 396-2120. Requests to access, change, or delete your information will be handled within 30 days. RepuGen.com Customers may electronically submit data or information to the Services for hosting and processing purposes (“Customer Data”). RepuGen.com will not review, share, distribute, or reference any such Customer Data except as provided in the RepuGen.com Master Subscription Agreement, or as may be required by law. In accordance with the RepuGen.com Master Subscription Agreement, RepuGen.com may access Customer Data only for the purpose of providing analysis or preventing or addressing service or technical problems or as may be required by law. RepuGen.com uses robust security measures to protect Data About RepuGen.com Customers and Data of RepuGen.com Customers. Because the Company uses the Services to maintain Data About RepuGen.com Customers and Data of RepuGen.com Customers, this information, which is stored in the Services, can only be accessed by Hackers. While RepuGen.com does its best to prevent Hackers; the company cannot guarantee that your information cannot be hacked. Mobile Applications may provide RepuGen.com with information related to Users’ use of the Mobile Application services, information regarding Users’ computer systems, and information regarding Users’ interaction with Mobile Applications, which RepuGen.com may use to provide and improve the Mobile Application services. For example, all actions taken in a Mobile Application may be logged, along with associated information (such as the time of day when each action was taken). RepuGen.com may also share anonymous data about these actions with third party providers of analytics services. In addition, if a User downloads a RepuGen.com Mobile Application after clicking on a third-party mobile advertisement for the Mobile Application or for RepuGen.com, the third-party advertiser may provide RepuGen.com with certain information, such as the User’s Device identification information, which RepuGen.com may use to track the performance of its advertising campaigns. Customers may configure RepuGen.com Mobile Application services, and the information accessed or obtained by the Mobile Application on a User’s Device may be affected by the Customer’s configuration. In addition, if a Customer purchases more than one Service from RepuGen.com and its affiliates, a Mobile Application may be designed to interoperate with those Services; for instance, to provide a User with access to information from any or all of those Services or to provide information from a User’s Device to any or all of those Services. Information accessed or obtained by the Mobile Application on a User’s Device may be accessible to the Customer and its organization, depending on the intended functionality of the Mobile Application. Privacy, 19800 MacArthur Boulevard Suite 300, Irvine, CA 92612. This Agreement was last updated on January 13, 2016. It is effective between You and Us as of the date of You accepting this Agreement. “Beta Services” means REPUGEN services or functionality that may be made available to Customer to try at its option which is clearly designated as beta, pilot, limited release, developer preview, non-production, evaluation, or by a similar description. “Content” means information obtained by REPUGEN from publicly available sources or third party content providers and made available to Customer through the Services, Beta Services or pursuant to an Order Form, as more fully described in the Documentation. “Documentation” means the applicable Service’s Trust and Compliance documentation, and its usage guides and policies, as updated from time to time, accessible via help.RepuGen.com or login to the applicable Service. “Services” means the products and services that are ordered by You under an Order Form or contract, or provided to You under a free trial, and made available online by Us, including associated REPUGEN offline or mobile components, as described in the Documentation. “We,” “Us” or “Our” means the RepuGen.com company described in Section 13 (Who You Are Contracting With, Notices, Governing Law and Jurisdiction). “Your Data” means electronic data and information submitted by or for Customer to the Services, excluding Content and Non-REPUGEN Applications. 3.1. Provision of Purchased Services. We will (a) make the Services and Content available to You pursuant to this Agreement and the applicable Order Forms, (b) provide applicable REPUGEN standard support for the Services to You at no additional charge, and/or upgraded support if purchased, (c) use commercially reasonable efforts to make the online Services available 24 hours a day, 7 days a week, except for: (i) planned downtime (of which We shall give advance electronic notice as provided in the Documentation), and (ii) any unavailability caused by circumstances beyond Our reasonable control, including, for example, an act of God, act of government, flood, fire, earthquake, civil unrest, act of terror, strike or other labor problem (other than one involving Our employees), Internet service provider failure or delay, or denial of service attack. 3.2. Protection of Your Data. We will maintain administrative, physical, and technical safeguards for protection of the security, confidentiality and integrity of Your Data. Those safeguards will include, but will not be limited to, measures for preventing access, use, modification or disclosure of Your Data by Our personnel except (a) to provide the Purchased Services and prevent or address service or technical problems, (b) as compelled by law in accordance with Section 8.3 (Compelled Disclosure) below, or (c) for aggregating it with other data for analysis purposes, or (d) as You expressly permit in writing. 3.3. Our Personnel. We will manage the performance of Our personnel (including Our employees and contractors) and their compliance with Our obligations under this Agreement. 3.4. Beta Services. From time to time, We may make Beta Services available to You at no charge. You may choose to try such Beta Services or not in Your sole discretion. Beta Services are intended for evaluation purposes and not for production use, are not supported, and may be subject to additional terms. Beta Services are not considered “Services” under this Agreement, however, all restrictions, Our reservation of rights and Your obligations concerning the Services shall apply equally to Your use of Beta Services. Unless otherwise stated, any Beta Services trial period will expire upon the earlier of one year from the trial start date or the date that a version of the Beta Services becomes generally available without the applicable Beta Services designation. We may discontinue Beta Services at any time in Our sole discretion and may never make them generally available. We will have no liability for any harm or damage arising out of or in connection with a Beta Service. 4.2 Usage Limits. Services and Content are subject to usage limits, including, for example, the quantities specified in Order Forms and Documentation. Unless otherwise specified, (a) a quantity in an Order Form refers to Users, and the Service or Content may not be accessed by more than that number of Users, (b) a User’s password may not be shared with any other individual, and (c) except as set forth in an Order Form, a User identification may only be reassigned to a new individual replacing one who will no longer use the Service or Content. If You exceed a contractual usage limit, We may work with You to seek to reduce Your usage so that it conforms to that limit. If, notwithstanding Our efforts, You are unable or unwilling to abide by a contractual usage limit, You will execute an Order Form for additional quantities of the applicable Services or Content promptly upon Our request, and/or pay any invoice for excess usage. 4.3 Your Responsibilities. You will (a) be responsible for Users’ compliance with this Agreement, Documentation and Order Forms, (b) be responsible for the accuracy, quality and legality of Your Data and the means by which You acquired Your Data, (c) use commercially reasonable efforts to prevent unauthorized access to or use of Services and Content, and notify Us promptly of any such unauthorized access or use, (d) use Services and Content only in accordance with this Agreement, Documentation, Order Forms and applicable laws and government regulations, and (e) comply with terms of service of any Non-REPUGEN Applications with which You use Services or Content. Service or any part, feature, function or user interface thereof, (i) copy Content except as permitted herein or in an Order Form or the Documentation, (j) frame or mirror any part of any Service or Content, other than framing on Your own intranets or otherwise for Your own internal business purposes or as permitted in the Documentation, (k) access any Service or Content in order to build a competitive product or service or to benchmark with a Non-REPUGEN product or service, or (l) reverse engineer any Service (to the extent such restriction is permitted by law). Any use of the Services in breach of this Agreement, Documentation or Order Forms, by You or Users that in Our judgment threatens the security, integrity or availability of Our services, may result in Our immediate suspension of the Services, however We will use commercially reasonable efforts under the circumstances to provide You with notice and an opportunity to remedy such violation or threat prior to such suspension. You may not access or use the Site or the Products in a way that uses technology or other means to access, index, re-render, frame, mirror, truncate, add to, inject, filter or link to the Site or the Products that is not authorized by us (including by removing, disabling, bypassing, or circumventing any content protection or access control mechanisms intended to prevent the unauthorized use, download, linking, framing, reproduction, access to, or distribution of the Site or the Products). You may not use any deep-link, page-scrape, robot, crawl, index, spider, offline reader, click spam, macro programs, internet agent, or other automatic device, program, algorithm or methodology which does the same things, to use, access, copy, index, acquire information, generate impressions or clicks, input information, store information, search, generate searches, or monitor any portion of the Site or the Products for any unauthorized purpose. You may not use the Site or the Products in a way that, to be determined in our sole discretion, damages, disables, overburdens, impairs, or gains unauthorized access to the Site or the Products, including RepuGen’s servers, computer network, or user accounts. You may not use the Site or the Products in a way that removes, modifies, disables, blocks, obscures or otherwise impairs any advertising in connection with the Site or the Products. You may not copy, display, distribute, download, license, modify, publish, re-post, reproduce, reuse, sell, transmit, use to create a derivative work, or otherwise use the content of the Site or the Products for public or commercial purposes without our express written permission. You shall not interfere with or disrupt the Site or any related RepuGen websites or servers or networks connected to the Site or the Products. You shall not use the Site or the Products in violation of applicable law or third party rights (including third party terms of service), and shall not use the Site or the Products for hosting content (for example, images and documents) that infringes on the intellectual property rights of others. You shall not repeatedly upload and remove unique email addresses or otherwise try to manipulate data in an attempt to circumvent our Fee Schedule or other billing procedures. You shall not set up multiple accounts for any individual or organization in order to send substantially similar content unless you are part of a franchise. You shall not include any incentives (for example, coupons, discounts or awards) in any messages you send by means of the Site or the Products that encourage a recipient to forward the message to another recipient, other than as expressly encouraged and permitted within the applicable Product (such as when you offer a Deal (defined below) and we encourage you to incentivize third parties to share your Deal). 4.5 External-Facing Services. If You subscribe to a Service for sending electronic messages or for the creation and hosting of, or for posting content on, external-facing websites, You are solely responsible for complying with applicable law in Your use of any cookies or other tracking technologies. 4.6 Removal of Content and Non-RepuGen.com Applications. If We are required by a licensor to remove Content, or receive information that Content provided to You may violate applicable law or third-party rights, We may so notify You and in such event You will promptly remove such Content from Your systems. If We receive information that a Non-RepuGen.com Application hosted on a Service by You may violate applicable law or third-party rights, We may so notify You and in such event You will promptly disable such Non-RepuGen.com Application or modify the Non-RepuGen.com Application to resolve the potential violation. If You do not take required action in accordance with the above, We may disable the applicable Content, Service and/or Non-RepuGen.com Application until the potential violation is resolved. 4.7 Prohibition on Spam; Permission Practices. (a) Prohibition on Spam. The Site and the Products may not be used for the sending of unsolicited text or email messages (sometimes called "spam"). All messages sent by means of the Site or the Products shall be in compliance with standard anti-spam policies. You are responsible for ensuring that your use of the Site and the Products do not generate a number of spam or other complaints in excess of industry norms. We may terminate your access to or use of the Site and the Products if we determine that your level of spam or other complaints is higher than industry norms, as determined by us in our sole discretion. As a matter of privacy, we will not share with you information about those recipients who complain about your use of the Products or file a spam report against you. You agree to import, access or otherwise use only contact lists in connection with the Site and the Products for which all listed parties have consented to receive correspondence from you (such as by opting into your "Join My Mailing List" link or signing on as your customer). You agree not to send messages through the Site or the Products to distribution lists, newsgroups, publicly available press or media addresses or purchased email addresses. We reserve the right without notice to take all measures of any nature (whether legal, technical or otherwise) to prevent unsolicited bulk test or email and/or other unauthorized text/email, messages or campaigns from entering, utilizing or remaining within our network. You agree that you are the sole or designated "sender" (as such term is defined in the CAN-SPAM Act of 2003 and any rules or regulations adopted under such act (the "CAN-SPAM Act")) of any message sent by you using the Site or the Products. Similarly, for messages sent to Canadian email accounts, you are the sole person sending or causing or permitting the message to be sent by you using the Site or the Products (within the meaning of Canada's Anti-Spam Legislation, S.C. 2010, c. 23 ("Canada's Anti-Spam Legislation")). You agree that for any email message sent by you using the Site or the Products, (i) the "from" line of any email message sent by you using the Site or the Products will accurately and in a non-deceptive manner identify your organization, your product or your service, (ii) the "subject" line of any email message sent by you using the Site or the Products will not contain any deceptive or misleading content regarding the overall subject matter of the email message, and (iii) you will include your valid physical address, which, if you are located in the United States, may be a valid post office box meeting the registration requirements established by the United States Postal Service. 5.1. We or third parties may make available (for example, through a Marketplace or otherwise) third-party products or services, including, for example, Non-REPUGEN Applications and implementation and other consulting services. Any acquisition by You of such products or services, and any exchange of data between You and any Non-REPUGEN provider, product or service is solely between You and the applicable Non-REPUGEN provider. We do not warrant or support Non-REPUGEN Applications or other Non-REPUGEN products or services, whether or not they are designated by Us as “certified” or otherwise, unless expressly provided otherwise in an Order Form. 5.2. Non-REPUGEN Applications and Your Data. If You choose to use a Non-REPUGEN Application with a Service, You grant Us permission to allow the Non-REPUGEN Application and its provider to access Your Data as required for the interoperation of that Non-REPUGEN Application with the Service. We are not responsible for any disclosure, modification or deletion of Your Data resulting from access by such Non-REPUGEN Application or its provider. 5.3. Integration with Non-REPUGEN Applications. The Services may contain features designed to interoperate with Non-REPUGEN Applications. To use such features, You may be required to obtain access to such Non-REPUGEN Applications from their providers, and may be required to grant Us access to Your account(s) on such Non-REPUGEN Applications. We cannot guarantee the continued availability of such Service features, and may cease providing them without entitling You to any refund, credit, or other compensation, if for example and without limitation, the provider of a Non-REPUGEN Application ceases to make the Non-REPUGEN Application available for interoperation with the corresponding Service features in a manner acceptable to Us. 6.3. Overdue Charges. If any invoiced amount is not received by Us by the due date, then without limiting Our rights or remedies, (a) those charges may accrue late interest at the rate of 2.5% of the outstanding balance per month, or the maximum rate permitted by law, whichever is lower, and/or (b) We may condition future subscription renewals and Order Forms on payment terms shorter than those specified in Invoicing and Payment. 6.4. Suspension of Service and Acceleration. If any amount owing by You under this or any other agreement for Our services is 30 or more days overdue (or 10 or more days overdue in the case of amounts You have authorized Us to charge to Your credit card), We may, without limiting Our other rights and remedies, accelerate Your unpaid fee obligations under such agreements so that all such obligations become immediately due and payable, and suspend Our services to You until such amounts are paid in full. Other than for customers paying by credit card or direct debit whose payment has been declined, We will give You at least 10 days’ prior notice that Your account is overdue before suspending Your services. 6.6. Taxes. Our fees do not include any taxes, levies, duties or similar governmental assessments of any nature, including, for example, value-added, sales, use or withholding taxes, assessable by any jurisdiction whatsoever (collectively, “Taxes”). You are responsible for paying all Taxes associated with Your purchases hereunder. If We have the legal obligation to pay or collect Taxes for which You are responsible, We will invoice You and You will pay that amount unless You provide Us with a valid tax exemption certificate authorized by the appropriate taxing authority. For clarity, We are solely responsible for taxes assessable against Us based on Our income, property and employees. 7.3. License to Host Your Data and Applications. You grant Us, Our Affiliates and applicable contractors a worldwide, limited-term license to host, copy, transmit and display Your Data, and any Non-REPUGEN Applications and program code created by or for You using a Service or for use by You with the Services, as reasonably necessary for Us to provide the Services in accordance with this Agreement. Subject to the limited licenses granted herein, We acquire no right, title or interest from You or Your licensors under this Agreement in or to any of Your Data, Non-REPUGEN Application or such program code. 7.6. No Rights in Software. This is an Agreement for services and access to the Site, and, except as expressly set forth herein, you are not granted a license to any software by this Agreement and nothing on the Site shall be construed to confer any grant or license of any intellectual property rights, whether by estoppel, by implication, or otherwise. You will not, directly or indirectly, reverse engineer, decompile, disassemble, or otherwise attempt to discover the source code, object code, or underlying structure, ideas, or algorithms of, or found at or through the Site or the Products or any software, documentation, or data related to the Site or the Products ("Software"); remove any proprietary notices or labels from the Site or the Products or any Software; modify, translate, or create derivative works based on the Site or the Products or any Software; or copy, distribute, pledge, assign, or otherwise transfer or encumber rights to the Site or the Products or any Software. If you are using the Site or the Products in any jurisdiction which restricts the ability of a software provider to restrict your right to reverse engineer, decompile, disassemble, or otherwise attempt to discover the source code, object code, or underlying structure, ideas, or algorithms of the Site, the Software or the Products, then you hereby covenant that, prior to engaging in such activities, you will first request that we perform such work at our standard professional services rates. We can then decide either: (a) to perform the work in order to achieve such interoperability and charge our then standard rates for such work to you; (b) to permit you to reverse engineer parts of the Software in order to obtain such source code, but only to the extent necessary to achieve such interoperability; or (c) to provide you with the information that you need regarding the Software for the purpose for which applicable law permits you to engage in such activities despite a contractual prohibition on such activities. 7.6.1. Permitted Use of the Site or the Products. The Site and the Products shall be used for your personal or internal business (which includes civic or charitable) purposes only, in compliance with this Agreement (including, without limitation, Section 5 hereof) and you shall not use the Site, the Products or any Software for timesharing or service-bureau purposes or otherwise for the benefit of a third party. Unless you are an authorized reseller of the Products, you may not display, copy, reproduce, or distribute the Software, any component thereof, any documentation provided in connection with Site, the Products or the Software, or any content, including but not limited to newsletters distributed to you by us in connection with the Products. The Site and the Products shall only be used for lawful purposes and you shall use the Site and the Products only in compliance with this Agreement, the CAN-SPAM Act and regulations thereunder and all other applicable U.S., state, local and international laws in your jurisdiction, including but not limited to (a) Canada's Anti-Spam Legislation and any other policies and laws related to unsolicited emails, spamming, privacy, obscenity, or defamation, copyright and trademark infringement and child protective email address registry laws, (b) laws relating to advertising, sales or promotional efforts or practices, redemption, refunds and provision of your products or services, (c) laws that govern false, unfair and deceptive practices, coupons, gift cards/certificates, defective products or services, unclaimed property, alcohol or tobacco, health and safety, fire, and hygiene standards, and (d) laws that govern lotteries, sweepstakes, contests and promotions and (e) laws that govern the collection of donations and charitable giving. Although we have no obligation to monitor the content provided by you or your use of the Site or the Products, we may do so and may block any messages or campaigns, remove any content, including surveys, event registrations, social campaigns, Promotions, Deals or Business Content, or prohibit any use of the Site or the Products that we believe may be in violation of the foregoing or any other provision of this Agreement. You further understand and agree that we and any applicable third party who supports, posts, publishes or distributes your Promotions, Deals or Business Content also has the right to reformat, edit, monitor, reject, block or remove any of your Promotions, Deals or Business Content at any time. In no case will the foregoing make us responsible or liable for compliance with any such laws or obligations, for which you remain solely responsible and liable. You acknowledge that we may from time to time provide you with marketing advice and other coaching, template design, frequently asked questions and tips on best practices and complying with applicable law, including any sample Offer Terms. You acknowledge that such assistance and information is provided as a convenience to you and that such assistance and information are not intended to and do not constitute legal advice and that no attorney-client relationship is formed. We do not warrant or guarantee that use of or compliance with this information will be sufficient to comply with your obligations hereunder, applicable law or with third party rights. 8.2. The Receiving Party will use the same degree of care that it uses to protect the confidentiality of its own confidential information of like kind (but not less than reasonable care) to (i) not use any Confidential Information of the Disclosing Party for any purpose outside the scope of this Agreement and (ii) except as otherwise authorized by the Disclosing Party in writing, limit access to Confidential Information of the Disclosing Party to those of its and its Affiliates’ employees and contractors who need that access for purposes consistent with this Agreement and who have signed confidentiality agreements with the Receiving Party containing protections not materially less protective of the Confidential Information than those herein. Neither party will disclose the terms of this Agreement or any Order Form to any third party other than its Affiliates, legal counsel and accountants without the other party’s prior written consent, provided that a party that makes any such disclosure to its Affiliate, legal counsel or accountants will remain responsible for such Affiliate’s, legal counsel’s or accountant’s compliance with this “Confidentiality” section. Notwithstanding the foregoing, We may disclose the terms of this Agreement and any applicable Order Form to a subcontractor or Non-REPUGEN Application Provider to the extent necessary to perform Our obligations to You under this Agreement, under terms of confidentiality materially as protective as set forth herein. 9. Warranty Disclaimer; Remedies; Release. YOU EXPRESSLY AGREE THAT THE SITE AND THE PRODUCTS (INCLUDING ANY CUSTOM SERVICES OFFERINGS) ARE PROVIDED ON AN "AS IS" AND "AS AVAILABLE" BASIS. USE OF THE SITE OR THE PRODUCTS AND ANY RELIANCE BY YOU UPON THE SITE OR THE PRODUCTS, INCLUDING ANY ACTION TAKEN BY YOU BECAUSE OF SUCH USE OR RELIANCE, IS AT YOUR SOLE RISK. WE DO NOT WARRANT THAT THE USE OF THE SITE OR THE PRODUCTS WILL BE UNINTERRUPTED OR ERROR FREE, NOR DO WE MAKE ANY WARRANTY AS TO THE RESULTS THAT MAY BE OBTAINED FROM USE OF THE SAME. WE DISCLAIM ALL WARRANTIES, EXPRESS OR IMPLIED, INCLUDING, BUT NOT LIMITED TO, IMPLIED WARRANTIES OF MERCHANTABILITY, FITNESS FOR A PARTICULAR PURPOSE AND NONINFRINGEMENT. NO STATEMENT OR INFORMATION, WHETHER ORAL OR WRITTEN, OBTAINED FROM US IN ANY MEANS OR FASHION SHALL CREATE ANY WARRANTY NOT EXPRESSLY AND EXPLICITLY SET FORTH IN THIS AGREEMENT. WE DO NOT ENDORSE AND ARE NOT RESPONSIBLE FOR (a) THE ACCURACY OR RELIABILITY OF ANY THIRD PARTY CONTENT, OPINION, ADVICE OR STATEMENT MADE BY ANYONE OTHER THAN US, OR (b) ANY EVENT HOSTED, DONATION SOLICITED, THE RESULTS OF ANY SURVEY, OR ANY PRODUCT OR SERVICE PURCHASED OR OTHERWISE OBTAINED FROM ANY THIRD PARTY, INCLUDING OUR CUSTOMERS. NO CLAIM MAY BE ASSERTED BY YOU AGAINST US MORE THAN 12 MONTHS AFTER THE DATE OF THE CAUSE OF ACTION UNDERLYING SUCH CLAIM. YOUR SOLE AND EXCLUSIVE REMEDY FOR ANY FAILURE OR NONPERFORMANCE OF THE SITE OR THE PRODUCTS SHALL BE FOR US TO USE COMMERCIALLY REASONABLE EFFORTS TO ADJUST OR REPAIR THE SITE OR THE PRODUCTS. TO THE EXTENT THE LAW PERMITS, YOU RELEASE US FROM ANY CLAIMS OR LIABILITY RELATED TO (a) ANY CONTENT POSTED ON YOUR SITE OR IN ANY MATERIALS YOU SEND USING THE SITE OR THE PRODUCTS, (b) THE CONDUCT OF ANY OTHER CUSTOMERS OF OURS OR THEIR RESPECTIVE SUBSCRIBERS AND (c) ANY PROBLEMS THAT MAY ARISE FROM ANY REMOTE ACCESS TO YOUR COMPUTERS OR OTHER SYSTEMS YOU PROVIDE TO OUR PERSONNEL OR AGENTS FOR THE PURPOSE OF TROUBLESHOOTING ISSUES. YOU HEREBY WAIVE CALIFORNIA CIVIL CODE SECTION 1542 (IF YOU ARE A CALIFORNIA RESIDENT), AND ANY SIMILAR PROVISION IN ANY OTHER JURISDICTION (IF YOU ARE A RESIDENT OF SUCH JURISDICTION). 9.2. Our Warranties. We warrant that during an applicable subscription term (a) this Agreement, the Order Forms and the Documentation will accurately describe the applicable administrative, physical, and technical safeguards for protection of the security, confidentiality and integrity of Your Data, (b) We will not materially decrease the overall security of the Services, (c) the Services will perform materially in accordance with the applicable Documentation, and (d) subject to the “Integration with Non-REPUGEN Applications” section above, We will not materially decrease the overall functionality of the Services. For any breach of a warranty above, Your exclusive remedies are those described in the “Termination” and “Refund or Payment upon Termination” sections below. 9.4 Your Content and Contacts. We will also obtain any information that you provide to us in connection with your use of the Site or the Products, such as contact lists (including email addresses and phone numbers of your subscribers) and content (including Business Content). We acknowledge your ownership rights in such contact lists and content ("Customer Information"). We will never sell or rent your Customer Information to anyone without your permission, and will never use your Customer Information for any purpose other than providing our products and services or as described herein. In the event we amend or revise the policy described in the immediately preceding sentence, we will provide advance notice of such amendment or revision. You are solely responsible for the accuracy, quality, integrity, legality, reliability and appropriateness of all Customer Information, and you are responsible for maintaining, securing and storing all Customer Information in accordance with applicable law and any contractual obligations you may have (including this Agreement). You represent and warrant that you own or have secured all rights and interest in and to the Customer Information required for us to use the Customer Information as contemplated by this Agreement. To the extent you use images or templates provided by us, we hereby grant to you a revocable, non-exclusive, royalty-free, worldwide license to use, reproduce, publish, distribute, perform and display the images solely in connection with your use of the Site or the Products. To the extent permitted by applicable law, we may make and preserve copies of all Customer Information as necessary to provide the Site or the Products and for internal back-up and other legal or regulatory purposes. Submissions. If you submit any suggestions, business information, ideas, concepts or inventions or content to us through the Site or otherwise ("Submissions"), you agree such Submission is non-confidential for all purposes and you automatically grant, or warrant that the owner of such content or intellectual property has expressly granted, us a non-exclusive, royalty-free, perpetual, irrevocable, worldwide license, with the right to sublicense, to use, reproduce, create derivative works from, modify, publish, edit, translate, distribute, perform and display such Submission in any manner or in any media now known or hereafter created. Automated Data Collection. You consent to us collecting data from your website through automated means, such as through harvesting bots, robots, spiders, or scrapers ("Automated Data Collection") and the use of that data for internal business purposes. We will not use Automated Data Collection to collect data from your website if you have set the /robots.txt file to disallow such collection. Backups. You are responsible for making frequent backup copies of your Customer Information, including your contact lists. You hereby agree to defend, indemnify and hold harmless us and our underlying service providers (i.e. vendors who help us provide the Products), business partners, third-party suppliers and providers, members of our Network, account providers, licensors, officers, directors, employees, distributors and agents from and against any damages, losses, liabilities, penalties, settlements and expenses (including costs and reasonable attorneys' fees) in connection with any claim or action that (a) arises from any actual or alleged breach by you of this Agreement; (b) arises from your Customer Information, including the content or effects of any messages you distribute, surveys you administer, social media campaigns you publish, Promotions or Deals you offer, or services you sell (including, without limitation, claims relating to violations of law, false advertising, injuries, illness, damages, death, taxes, fulfillment, breach of Offer Terms, defective products or services or unclaimed property); (c) arises from your provision of incomplete or inaccurate information to your subscribers or customers; (d) arises from your activities or postings in any Community; (e) arises from your use of any Third Party Service (as defined below); (f) arises from your activities related to the RepuGen Authorized Local Expert Program or the RepuGen Boot Camp; or (g) otherwise arises from or relates to your use of the Site or the Products. You agree to provide us with prompt written notice in the event of any such claims or actions. In addition, you acknowledge and agree that we have the right to seek damages when you use the Site or the Products for unlawful purposes, in an unlawful manner, or in a manner inconsistent with the terms of this Agreement, and that such damages may include, without limitation, direct, indirect, special, incidental, cover, reliance and/or consequential damages. In the event that we are required to respond to a third party or law enforcement subpoena or court order that is related to your use of the Site or the Products, we may, in our sole discretion, require you to reimburse us for our reasonable expenses associated with complying with such subpoena or order. EXCEPT WITH RESPECT TO DEATH OR PERSONAL INJURY DUE TO THE NEGLIGENCE OF REPUGEN, TO THE MAXIMUM EXTENT PERMITTED BY APPLICABLE LAW, UNDER NO CIRCUMSTANCES AND UNDER NO LEGAL THEORY, TORT, CONTRACT, OR OTHERWISE, SHALL REPUGEN OR ANY OF ITS UNDERLYING SERVICE PROVIDERS, BUSINESS PARTNERS, THIRD PARTY SUPPLIERS AND PROVIDERS AND MEMBERS OF OUR NETWORK, ACCOUNT PROVIDERS, LICENSORS, OFFICERS, DIRECTORS, EMPLOYEES, DISTRIBUTORS OR AGENTS (COLLECTIVELY REFERRED TO FOR PURPOSES OF THIS SECTION AS "REPUGEN") BE LIABLE TO YOU OR ANY OTHER PERSON FOR ANY MONEY DAMAGES, WHETHER DIRECT, INDIRECT, SPECIAL, INCIDENTAL, COVER, RELIANCE OR CONSEQUENTIAL DAMAGES, EVEN IF REPUGEN SHALL HAVE BEEN INFORMED OF THE POSSIBILITY OF SUCH DAMAGES, OR FOR ANY CLAIM BY ANY OTHER PARTY, AND REGARDLESS OF THE FORM OF ACTION (WHETHER IN CONTRACT, TORT (INCLUDING NEGLIGENCE), PRODUCT LIABILITY OR OTHERWISE), THE MAXIMUM AGGREGATE LIABILITY OF REPUGEN TO YOU ARISING IN CONNECTION WITH THIS AGREEMENT SHALL BE LIMITED TO THE AMOUNT YOU PAID FOR THE APPLICABLE PRODUCT IN THE 12 MONTHS PRIOR TO THE ACCRUAL OF THE APPLICABLE CLAIM, LESS ANY DAMAGES PREVIOUSLY PAID BY REPUGEN TO YOU IN THAT 12 MONTH PERIOD. SOME JURISDICTIONS DO NOT ALLOW THE EXCLUSION OR LIMITATION OF INCIDENTAL OR CONSEQUENTIAL DAMAGES, SO THIS LIMITATION AND EXCLUSION MAY NOT APPLY TO YOU. You agree that RepuGen has set its prices and entered into this Agreement in reliance upon the disclaimers of warranty and the limitations of liability set forth herein, that they reflect an allocation of risk between the parties (including the risk that a contract remedy may fail of its essential purpose and cause consequential loss), and that they form an essential basis of the bargain between the parties. 12.2. Term of Purchased Subscriptions. Term of Subscriptions. The term of each subscription shall be as specified in the applicable Order Form. Except as otherwise specified in an Order Form, subscriptions will automatically renew for additional periods equal to the expiring subscription term or one year (whichever is shorter), unless either party gives the other notice of non-renewal at least 30 days before the end of the relevant subscription term. The per-unit pricing during any renewal term will increase by up to 7% above the applicable pricing in the prior term, unless We provide You notice of different pricing at least 60 days prior to the applicable renewal term. Except as expressly provided in the applicable Order Form, renewal of promotional or one-time priced subscriptions will be at Our applicable list price in effect at the time of the applicable renewal. Notwithstanding anything to the contrary, any renewal in which subscription volume for any Services has decreased from the prior term will result in re-pricing at renewal without regard to the prior term’s per-unit pricing. You may terminate your RepuGen account at any time by calling RepuGen Customer Support. Except as specifically set forth herein or on the Site, there are no refunds for any fees paid. YOU ARE SOLELY RESPONSIBLE FOR TERMINATING YOUR REPUGEN ACCOUNT AND THIS AGREEMENT. WE ARE NOT RESPONSIBLE FOR YOUR FAILURE TO PROPERLY TERMINATE YOUR REPUGEN ACCOUNT AND THIS AGREEMENT OR FOR ANY CREDIT CARD OR OTHER CHARGES OR FEES YOU INCUR AS A RESULT OF YOUR FAILURE TO PROPERLY TERMINATE YOUR REPUGEN ACCOUNT AND THIS AGREEMENT. We may, in our sole discretion, terminate your RepuGen account or your access to or use of the Site or the Products, disable your RepuGen account or access to the Site or the Products, remove all or a portion of your Customer Information or data, cancel or suspend any of your Campaigns, or put your RepuGen account on inactive status, in each case at any time, with or without cause, with or without notice and without refund. We shall have no liability to you or any third party because of such termination or action, except that we will refund a pro rata portion of any prepaid amounts if we terminate you without cause. After termination, you shall get the database of your customers from RepuGen on MS Excel spreadsheet. If your RepuGen account is classified (at our sole discretion) as inactive for over 120 days, we have the right to permanently delete any of your Customer Information or data. Upon termination of your RepuGen account by you or us, this Agreement and any rights or licenses granted to you hereunder, shall immediately terminate. A party may also terminate this Agreement for cause (i) upon 30 days written notice to the other party of a material breach if such breach remains uncured at the expiration of such period, or (ii) if the other party becomes the subject of a petition in bankruptcy or any other proceeding relating to insolvency, receivership, liquidation or assignment for the benefit of creditors. 12.6. Surviving Provisions. The sections titled “Fees and Payment,” “Proprietary Rights and Licenses,” “Confidentiality,” “Disclaimers,” “Mutual Indemnification,” “Limitation of Liability,” “Refund or Payment upon Termination,” “Customer Data Portability and Deletion,” “Removal of Content and Non-REPUGEN Applications,” “Surviving Provisions” and “General Provisions” will survive any termination or expiration of this Agreement. 12.7 Disputes. Notwithstanding anything set forth herein to the contrary, any disputes about any charges to you under this Agreement must be submitted to us in writing within 60 days of the date such charges are incurred. You agree to waive all disputes not brought within the 60 day period, and all such charges will be final and not subject to challenge. You are responsible for maintaining the security of your RepuGen account, passwords and files (including the passwords and files that your Authorized Users, if any, have access to) and any Accounts. We will accept the instructions of any individual who claims to be authorized to direct changes to your RepuGen account so long as such person presents the Account Owner username and password or provides other appropriate account identifying information, as determined by us in our sole discretion, by email or by phone, or through a Third Party Service, if any, through which you access the Site or the Products. We have no knowledge of your organizational structure, if you are registering for the Products as an organization, or your personal relationships, if you are a person. You will be solely responsible and liable for any activity that occurs under your username and the activities of your Authorized Users, if any, and we shall not be responsible for the actions of any individuals who misuse or misappropriate your contact lists or other assets using your username and password or other appropriate account identifying information. You agree to notify us immediately of any unauthorized use of your RepuGen account or any other breach of security. 13.1. Full Force and Effect. RepuGen’s underlying service providers, business partners, third-party suppliers and providers, members of our Network, account providers, licensors, officers, directors, employees, distributors and agents are expressly made third party beneficiaries of this Agreement. Except as set forth in the immediately preceding sentence, nothing express or implied in this Agreement is intended to confer, nor shall anything herein confer, upon any person other than the parties and the respective permitted successors or assigns of the parties, any rights, remedies, obligations or liabilities whatsoever. In any action or proceeding to enforce rights under this Agreement, the prevailing party will be entitled to recover its costs and attorneys' fees. 19.9. Governing Law and Legal Actions. This Agreement shall be governed by the laws of the state of California, USA and all claims relating to or arising out of this Agreement, or the breach thereof, whether sounding in contract, tort or otherwise, shall likewise be governed by the laws of the state of California, in each case, without regard to its choice or law or conflict of law’s provisions. All legal actions in connection with this Agreement shall be brought in the state or federal courts located in Los Angeles, California.